As a graduate student, I spend a good amount of my time writing papers with titles like “The Ramifications of Convivial Design Mechanisms on Affective Responses.” This sentence doesn’t actually have any complex meaning (Translation: “How Group Features Make People Feel”), but by using a thesaurus, I can make it sound much more important—the secret of academics everywhere. Consequently, the thesaurus is an essential writing tool, and it’s only natural for established publishers and independent outfits alike to bring mobile thesauri to the iPhone. I took a look at a trio of apps to determine which is nonpareil. Word Watch: Thesaurus from SearchQuest provides a big list of synonyms, antonyms, and related terms but not much in the way of context. You get what you pay for with SearchQuest’s $1 Thesaurus application—there are no frills or extra features, just a simple keywords search which provides you with a list of words categorized as synonyms, antonyms, or related terms. 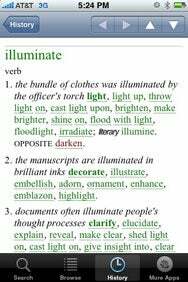 However, SearchQuest’s source material, which proudly advertises the contributions of “people on the internet,” often inaccurately identifies broader or narrower terms as synonyms. Additionally, there’s a reason thesauri include usage notes and examples—if you need a thesaurus, chances are you also need help deciding what the most appropriate term for your audience is. A big list of words provides no context, and no context becomes a barrier to comprehension. A Way With Words: Handy tools like autocomplete searching, usage notes, and the ability to bookmark entries makes Roget’s II: New Thesaurus a winner. At $10, Roget’s II: New Thesaurus from Enfour offers the best value for features and content. Roget’s II includes many handy tools like autocomplete searching, brief definitions, usage notes, and even professional features like wildcard searching. The app cross-links “See also” entries, but oddly doesn’t cross-link terms in the synonym list. While Roget’s included fewer of my test terms than the other two apps I looked at for this round-up, the entries included were concise, easy to read and understand. Roget’s allows users to bookmark entries and attach notes to an entry—a convenient feature for writers. 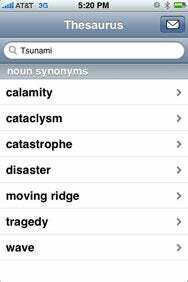 Is the Oxford Thesaurus of English worth $25 on the iPhone? Considering the print edition is nearly twice as expensive, and that Oxford’s dictionaries are the gold standard for English language reference, perhaps the cost is justified. As expected, the entries included in Handmark’s iPhone version of the Oxford Thesaurus of English are thorough, very accurate, and include usage notes and examples. Moreover, all terms in an entry are cross-linked (when there is a corresponding entry in the thesaurus), and the developer made an interesting and useful decision to first enlarge a term when tapped, rather than immediately taking the user to the entry. Linked In: Handmark’s Oxford Thesaurus of English features a cross-link for any term that has a corresponding entry within the mobile thesaurus. 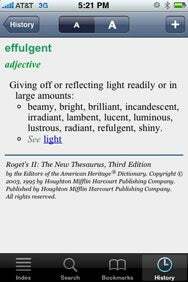 On the other hand, the Oxford Thesaurus of English should dazzle on the iPhone; instead its feature set comes up short when compared to Roget’s II. While the Oxford Thesaurus app also searches as you type, it does not provide advanced search abilities like wildcards—power users are likely to miss this. Like Roget’s, the app maintains a history of entries a user has looked at, but does not support bookmarking or attaching notes. In fact, even the $1 Thesaurus application lets users e-mail entries, but this too is missing from Oxford Thesaurus of English. Ultimately, the best thesaurus for you depends on your writing needs, and how much value you place on accurate content. However, Roget’s II stands out as a clear choice for anyone who needs both quality content and rich features. Thesaurus and Roget’s II: New Thesaurus are compatible with any iPhone or iPod touch running the iPhone 2.x software update. Oxford Thesaurus of English runs on the iPhone 2.1 update and higher.